As our primary blood donor cat, Prescott has helped save numerous lives since he joined the clinic in 2005. The largest of the clinic cats, he is often found relaxing (i.e. sleeping) at his "command post" on the love seat in the reception area. 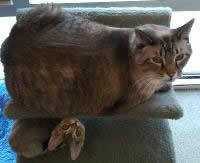 He's a 2002 model lynx point Siamese mix who is an absolute fool for catnip. Prescott has also been a patient "demo model" when clients need to learn how to give injections or subcutaneous fluids to their own cats. She is our most recent addition, having joined the clinic in the fall of 2011. 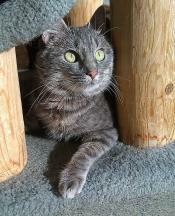 A grey tabby domestic shorthair, Benny was born in 2011 and came from the same riding stable as Peanut. As a kitten Benny suffered from severe digestive problems and chronic diarrhea, and, like Ebony, she was not able to grow to a normal size. She is now thriving but requires ongoing care. Benny has a very sweet face and tiny voice, and she loves to jump up onto counters so she can look you in the eye. 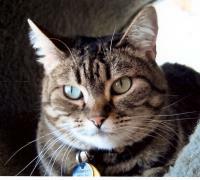 A brown tabby domestic shorthair, Peanut was rescued from a local riding stable where she had been dumped. She had cerebellar hypoplasia, a non-painful neurologic condition that caused her to wobble and have poor coordination between her front and hind legs. She, however, never knew anything was wrong with her and she thought all the other cats walked funny! Peanut was a real flirt, often rolling around on the carpet at men’s feet, batting her eyes and trying to get their attention. 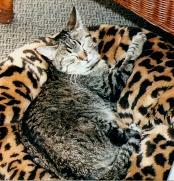 She was truly a one-of-a-kind cat, and a very special soul mate to Dr. Ortloff. 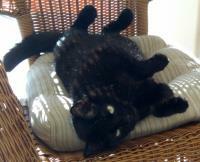 Ebony was our little "spitfire" - she was small in stature but had plenty of sass and attitude. She developed multiple skeletal deformities at a very young age, and never grew to a normal size. Her disabilities never stopped her from getting to where she wanted to go, and she often reminded Prescott that she was really the boss cat. Ebony made many friends by sitting at clients' feet, waving one of her little front paws and gazing adoringly until she was picked up. She was a funny little cat, and deeply missed. 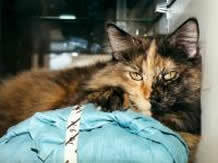 Libby, as she was called most of the time, was our initial blood donor cat and helped save many lives. 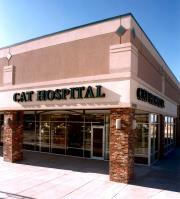 Dr. Ortloff adopted her from another veterinary clinic where she had been in and out of several homes. She was a very gentle but shy cat, and primarily spent her time at the clinic by helping as a paperweight on Dr. Ortloff's desk. In 2008 she "retired" from her blood donation duties at the clinic, and lived several happy years at Kari's house. A purebred Devon Rex, Razz was one of the original residents of the clinic. 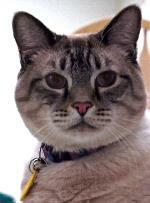 He had a career as a show and breeding cat before he was donated to the clinic due to his rare blood type (Type B). He was definitely our "quirkiest" and most social resident, and developed quite a fan club of visitors. He particularly loved searching in handbags for tissues, and crawling into the arms of unattended jackets for a cozy nap. Razz also earned the name "Goldilocks" due to his habit of opening other cats' kennel doors and helping himself to their food and beds! We miss him dearly - the clinic is not the same without his jaunty travels to and fro.